How Serious is Global Warming? – ETCCC. For most Americans, including most English teachers, the impact of climate change has not yet really sunk in. The corporate media is not informing us about the problem. Yet, what we do in the next few years will make the difference between the Earth warming 2ºC — Paris Agreement target — and 4ºC, and more. 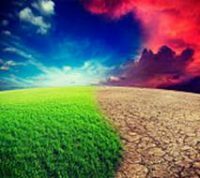 Humans have already warmed the earth 1.1ºC (2ºF) causing heat waves, droughts and famine, massive storms and flooding, wildfires, melting glaciers, disappearing polar ice, and warming, acidic oceans destroying fisheries, plankton, and coral reefs. The Intergovernmental Panel on Climate Change (IPCC) established by the United Nations and drawing on 1000s of scientists around the world, predicted about ten years ago that if humans were to continue on burning fossil fuels in the same way, “business as usual,” the Earth would most likely see by 2100, 90 years from now – in the lives of children born today –, an average global temperature increase of between 2º and 6º Celsius above the preindustrial average. But global warming is coming even faster than the estimates of the IPCC, a point made by many leading scientists. A widely cited research study indicates that human caused climate change is now adding the equivalent heat of 400,000 Hiroshima bombs to our atmosphere, every day. In the global instrumental temperature record, which goes back to the mid 19th Century, 16 of 17 hottest years ever recorded are since 2000. (Other one is 1998.) 2014 was hottest ever in the thermometer record. Until 2015 which was a disturbing .1º C warmer than 2014. And 2016 which was .12º C warmer than 2015. There is a lot of scientific research about what will happen at higher temperatures, both through models based on instrument data from the recent past, and on extensive paleoclimate studies that look at what has happened in the deep past when the Earth had previous warming episodes. Below we set forward what is currently known about how climate change will impact our planet. Much of our information comes from Lynas’ book Six Degrees: Our Future on a Hotter Planet, considered one the best researched books on global warming for a general audience. 2 Degrees C (3.6º F): Water shortages will have major impacts on agriculture around the world, including in North America and Michigan. When the global temperature increases by 2º C heat waves become increasingly deadly. The subtropic arid belt will move north from the Sahara, sweeping across the Mediterranean, rapidly increasing climate refugees. Melting of the Greenland ice sheet will eventually submerge coastal cities, home to tens of millions. There will be water shortages around the world and major famines in Africa, India, and South America. Stressed forests and soils will begin emitting CO2 rather than absorbing it. 2ºC is now inevitable. In Paris in 2015 the international community agreed to try to limit global warming to 2º C. President Trump’s current actions and appointments will take the United States out of compliance, and threaten the entire Paris Agreement. 3 Degrees C (5.4º F): Eventual 80 feet of sea-level rise, the end of the Amazon rain forest, huge hurricanes, and the Sahara extending as far north as France. *Hans Schellnhuber, one of the world’s leading climate scientists. 5 Degrees C (9º F): Humans are forced into shrinking ‘zones of habitability’ by excessive heat, droughts, and floods. Predicting the future at 5ºC requires looking back to the Paleocene-Eocene Thermal Maximum, 56 million years ago. Antarctica was covered with forest and crawling with crocodiles. Temperatures at the North Pole reached 77º Fahrenheit. Inland areas were 20º Fahrenheit or more hotter than today. There were tremendous downpours in the tropics, and increasing desertification of dry areas north and south of the Equator. Snowmelt water disappears and underground aquifers will likely be depleted. Heating and acidification threatens life even at the bottom of the ocean. 6 Degrees C (10.8º F): 6ºC may mean the near extinction of life on Earth. 252 million years ago when average global temperatures were 6ºC above preindustrial levels, 95% of life on Earth, on land and in the seas, was wiped out in the most severe extinction in Earth’s history, the End Permian Event. A likely cause was warming of the oceans leading to the catastrophic release of exploding fireballs of methane from seabeds. A major oceanic methane eruption would liberate energy around 10,000 times greater than the world’s entire stockpile of nuclear weapons. After the Permian Extinction it was 20 million years before the Earth again teemed with life. How serious is global warming? It may well be the most serious issue human beings have ever faced. This blog, English Teachers Concerned about Climate Change (ETCCC) is exploring what we can do. Follow us. Join with us. Experiment with teaching about climate change. Share your and your students’ experiences on this blog.